Jacks or Better - original video poker! Jacks Or Better rules are simple. Before beginning to play, you must decide what amount of coins or money you wish to invest into a round. The bigger the coin amount, the better will be the payout. Jacks or Better plays with a main hand and however many other hands you have selected. For example, if you are playing a three-hand game there will be a main hand (displayed above the Deal Button) and two additional hands displayed above the main hand. The main hand is bigger than other hands and is always the hand you play with. Whatever actions are applied to the main hand are always duplicated on other hands. Click the Deal Button to confirm your bet and turn over the first five cards. At this point you need to decide whether to hold or discard cards in the main hand. To hold a card, click on it. When you have clicked on all the cards you want to hold click the Deal Button again. Note, this will automatically discard any cards not held and these cards are replaced automatically in all hands. To unhold a card, click it again. 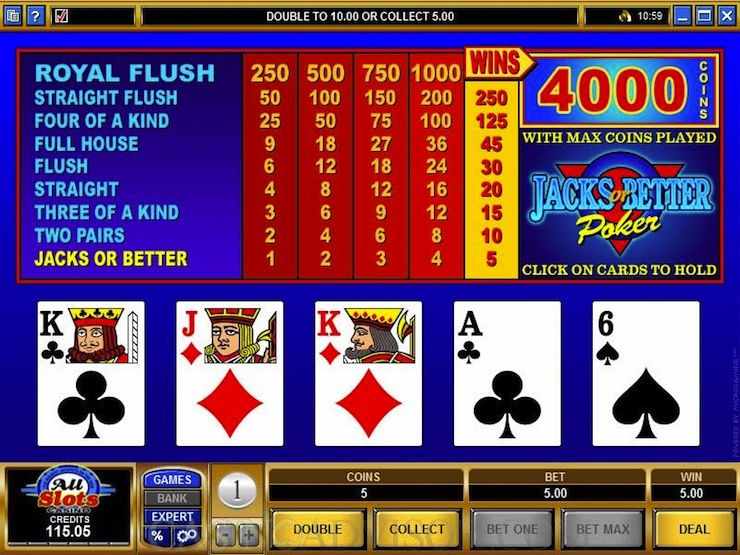 Jacks or Better is the most common video poker game available, and many or most video poker games are simply variations of Jacks or Better which offer some kind of bonus payout for particular hands.